Todd always wanted to be a firefighter. So he pursued that goal with everything he had, starting with volunteering as an EMT in high school. After graduating from the academy, he looked for open positions in states close to where he grew up — to be close to family. “After a few years of working in Pittsburgh, I thought it was time to put down roots of my own,” says Todd. He started looking at houses online, trying to figure out what he could afford. Todd was confident he could make the monthly payments, but saving up a 20% down payment for a house in his price range might have taken years. Fortunately, he found out about a down payment assistance (DPA) program that was developed specifically for people in selected professions, including first responders like Todd. He still had to meet the income asset, and property guidelines associated with the loan he was considering, but the DPA allowed him to buy his first home sooner rather than later. 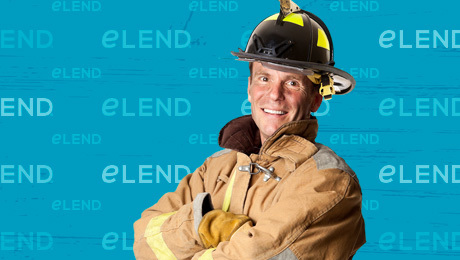 eLEND offers many DPAs. One special offering is called The Advantage Program. It’s for purchase-only loans — not for refinancing. If you qualify and are approved, your down payment assistance will be paid in the form of a forgivable grant at the time of closing. “Forgivable” means you don’t have to pay it back, and the loans are available in 20-, 25- and 30-year terms to allow for flexibility. It’s our way of trying to help hometown heroes like Todd achieve their dreams of home ownership.